The GOAT gave it her all at Wimbledon. She didn't clinch the title, but everyone can learn from how she handled it like a champion. The Wimbledon women’s final over the weekend came down to Serena Williams and Germany’s Angelique Kerber. Williams was aiming for a 24th Grand Slam singles title, but in the end, it was Kerber who emerged victorious, earning her first Wimbledon title. After the two players embraced and Williams congratulated Kerber on her achievement, she gave a moving post-match interview that is a prime example of how to find a win even in a tough loss. When asked about the appearance of being “superhuman, super mom,” she laughed. Wimbledon was Williams’s fourth tournament since giving birth to her daughter Alexis Olympia. In February, Williams wrote an essay for CNN about the nearly fatal complications she experienced after childbirth, including a pulmonary embolism and blood clots that led to a series of surgeries, and a recovery that required six weeks of bed rest. In the essay, she advocated for other women who don’t have access to the quality of care that she did. 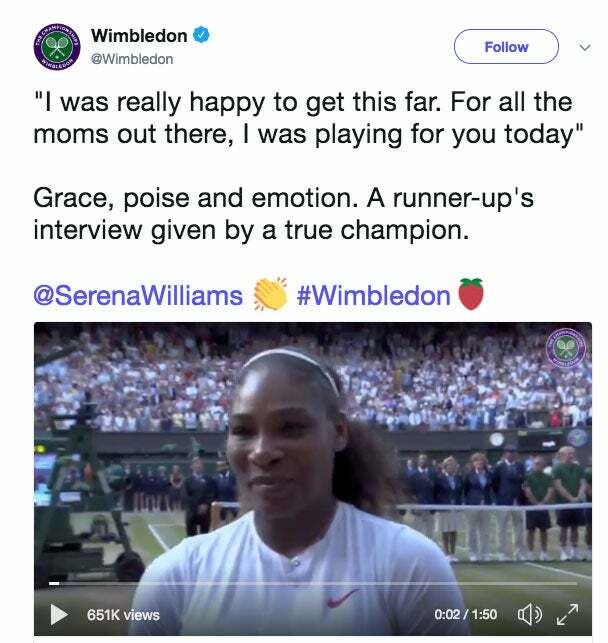 At a Wimbledon press conference earlier in the tournament, Williams was asked what it was like knowing that her opponents would always be bringing their A-game because she was Serena Williams. Given that answer, it won’t come as a surprise that Williams isn’t dwelling on the Wimbledon loss. She's already strategizing and training for the U.S. Open. Because when you know that you can strive for heights you have never seen before, a setback is only fuel for the next big success.